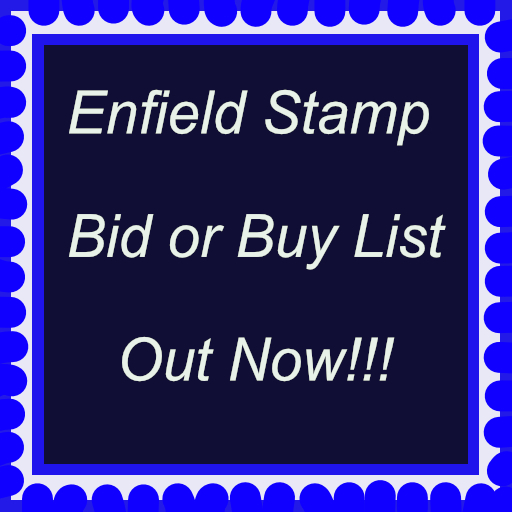 Enfield Stamp Bid or Buy List 458 - Enfield Stamp Company Ltd.
Christmas over and we are well into the New Year. Our Half Price Bargain Newsletters 456 & 457, Collections and Single Items, continue to sell well and I shall be keeping them open for a little while. Eric’s book list has been a bit slower than I imagined it would be. We have sold 199 from the 1830 to date. I’m surprised because many of the books are so hard to come by. Although I offered reductions in price for multiple purchases I am still stuck for space. So I have decided to offer an additional 10% reduction on top of the stated price incentives printed in the front of Newsletter 454. David has been briefly back from his travels so we have managed to describe quite a number of new lots for this Newsletter along with numerous singles and sets for our upcoming Postal Auction on February 16th. countries Antigua to Zululand but in no order,also G.B inc.1d. 19 Star Trek:1994 Guyana pres.packs with SG.4226-44 & MS.4245,fine. G.VI 1938 Defin.set to 5s.,etc.,later vals.to $3,fair to good. 96 1992-2008 Comms.sets & part sets U.coll.on leaves,good to fine. 107 1883-1914 extensive M.coll.on leaves inc:1883 to 50s.,1888 Ovpt. set to 5Pi.(UM. )1890 set to 20Pi. (SG.27-38),1900-01 set to 20Pi. 110 Newspaper Stamps:1916 Perf.12 1/2 set(M.)Perf.11 1/2 2h.& 10h. various sources inc.range seated Britannias,1920 Victory 1/4d.M. half of sheet shows Ovpt.misplaced to left,fine & most unusual. 126 1906 var.vals.to 5k.,1910 Birthday set to 5k.,M.,on leaves,fine. 10k.,1913-18 Comms.& Ovpts.,1904-16 P.Dues,good to fine. (95) STC. 130 All periods,predom 1930’s-1970’s,UM.& M.(few U. )Comms.& Defins. 137 All periods to 1976 U.coll.Comm.& Defin.on pages & loose inc:Q.V. 138 1953-c.1980 mainly M.,few U. (27)Comms.& Defins.to 2s.,lower val. 139 Foreign Bills:1885-1909 Extensive written up coll.on leaves inc.
1st,2nd & 3rd Exchanges represented,good to fine. Rarely offered. Yugoslavia or other Balkan throughout,needs sorting,fair to good. 155 1936 Industrial Exh.U.set & another set U.on cover with Exh. Zeppelin Ovpts.with extra 100m. (corner example)etc.,good to fine. 170 1926 Agricultural 100m.& 200m.in lower-left corner marg.Pl.No. 172 1914-22 M.range on leaves comp.1914 set to 200m.,1915 2m.Surch. 10Pi. (chalky surface issues)with shades,etc.,many fine. (41) STC. marg.block of ten,one showing var.Arabia 1493 for 1943,very fine. 1918-19 Imperf.set(M.& U. ),1919 5p.,1919-20 to 5m.(M. )& to 25m. 188 1918-25 U.coll.on leaves inc.1918-19 Imperfs.with 35p.grey(C.
3m.Imperf.from partly Perf.sheets(not cat.in SG.,listed SG.39a). 195 1918-19 small M.or Unused range on page,mainly Allied Occ.Ovpts. inc.1941 5Fr.x 6 (SG.137 C.£8 ea. ),1958-60 U.range to 200f.(SG. Nat.Assembly Air Cancels,also Weimar Stat.E.Ovpt’d for 1st Int. (U.,C.£57)& Berlin 1950 ORCHESTRA set(UM.,C.£210),good to fine. 221 1946-48 M.range on leaves,Numerals,Workers,Comms.,good to fine. 223 1945-46 8Pf.& 1m.U.on Reg.E.,01-7-46 cds.,good to fine. (1) 1m. 228 1948-49 U.Ovpts.range with vals.to 84Pf.,on leaves,good to fine. 84Pf. (C.£81),Comms.with GOETHE & LEIPZIG sets,etc.,good to fine. 237 1949-70 Conprehensive U.coll.on Davo leaves inc:1950 Phil.Exh. 241 1898 Ovpt.set M.to 50Pf.(25Pf.UM. )all with 56 degrees slope,good. 1968 to $2,1971 to $2,Comms.,etc.,fair to fine. (141+1 cvr.) STC. 247 C.1935-1971 predom UM.,few M.,accum.on St.leaves,inc:1969 H.Vals. (2 sets),1967 H.Vals.,Machins,1957 Graphites(2 sets),1948 RSW. pages 1d.red plates unchecked,1872-73 6d.pale buff Pl.12(SG.C. order & with dup.,Q.V.vals.to 1s.,with 1883-4 green & lilac U.
controls,block set to 1s.,1924 Wembleys(U. ),1925 1d.,1929 PUC.L. control inc:2 1/2d.with face & hair retouch(SG.Spec.Q com 6 C.
303 Army:Range on page inc:U.O41,O43,O44 & O45 & O42 M.,fair to good. S/bk.,inc.Lundy,Stroma & Pabay Ovpt.,etc.,unusual,good to fine. 315 1938-63 M.coll.on St.page inc:1938-46 set(No 40o.blue)etc.,good. 319 1932 1c.on 1 1/4ch.claret,Wmk.sideways,complete sheet of 84,marg. 322 Persia:1914-25 small U.range on pieces,var.Ovpts.,Airs,etc.,good. mounts)in Lindner hingeless album,inc:1949 Coin MS.,many Comm. 338 1928-30 Tripoli.Trade Fair issues U.,inc.3rd Trade Fair set(SG. 352 1931-36 U.coll.on pages with dup.in places,btwn.SG.191-247 inc.
358 1968-72 Postal Code Campaign sets in UM.corner bl.of 4,very fine. 360 1942-45 set to 40s.with add.shades,M.,on page,fine. (30) SG.btwn. 364 1947 New Constitution MS.,1947 Know Your Stamp MS.& 1947 Phil. 366 Mainly 1959-75 UM.`bits & pieces’ range on leaves inc.1959 Wedd. small sheets of twenty(20 & 30y. )or ten(50y. )1971 Tennis 15y. 379 1946-48 UM.or M.Comm.sets range on leaves with 1948 Defins.,fine. 384 1914-23 M.& U. (5)range on leaves inc:1915 Coro.4s.,10s.(M.,C. 1949 Children’s Day 5y.Bl.of four Imperf.from MS.(not cat.,MS.C. 394 1936 Kwantung Occupation set in UM.blocks of four,on leaves,fine. 1f. (SG.C.£73),1939 Royal Portrait 1f.25(SG.394 C.£80),etc.,good. 409 All periods to about 1990’s M.& U.accum.from various sources inc.
Ovpts.,1895-6 var.vals.with 3s.,1897-1900 to 1s.,var.Edws.to 6d. (2 diff. ),G.V to 2s. (also £1 Fiscal)1934-35 set ti 1s.,1935 S.J. 420 1948-49 UM.,M.& U.Comms.& Defins.extensive range on leaves inc. 10r.(3),15r. (2),25r,(3),all with diff.Perfs.,predom UM.,& var. 421 1949-83 Extensive UM. (many),M.& U.Comms.& Defins.coll.in L.L. 422 Postage Dues 1960 Ovpts.(M. ),sets to 1/6(2 U.,1 M.)on page,fine. 1933 Stross(M.& U. ),1933 Vieana(U. ),1933 Ex.60Gr.,1934 25g.& 1z. issue Ovpts.with dup.to 60Pf.,2nd ptg.with 3Pf. (2 M.),5 on 3Pf. (2 M.),25 on 7 1.2(M.)& a few dups.of other vals.,good to fine. 441 1919 Western Galicia Ovpts.:6h. (on piece),20h.,40h.,50h.,60h.,1k. 446 1928-29 Ceres Surch.set M.less 1E60 on 2E deep grey-green,good. 447 All periods M.& U.on pages & St.page inc:Azores 1994 booklet(SG. SB13 C.£8.25),St.page in random order,needs sorting,fair to good. Currencies,1970 to $2(with some dup. )1974 to $2,1978 to $2,Comms. 458 All periods to c.1980 Comms.& Defins.U.or CTO.U.range on St.
461 1952-73 U.Comms.& Defins.coll.on leaves inc:1953-9 set to 10s. 6d.,1916 & 1919 Ovpts.,1922 1d. (2),all U.,on page,fair to fine. 465 All periods to about 1980’s M.& U.accum.from various sources inc.
466 1994 Japanese Football League series UM.sheetlets on Hagner,SG. 468 All periods to 1974 M.& U.coll.on St.page with vals.to 2/6d.(SG. 473 P.Dues:1961 set with 1961 Officials set,UM.,on page,very fine. 475 1952 Railway set,1953 Chamoun set with two more set in horiz. 479 1961-99 predom U.Comms.& Defins.coll.on leaves inc:Ovpts.to 2L. 490 1933-1949 predom U. (15 M.),range on leaves inc:1933 to 3d.,S.J. 3d.,6d.,1938-54 many shades & Perfs.to 10s. (2),etc.,mostly fine. 495 1887-91 set to 64a to 1889 1a.on 1sio(2)U.,on page,good to fine. 499 1889-91 Provisional 1a.Ovpts.,two U.examples,types 14 & 15(C. Ovpts. (28,few M.),G.VI to $4.80,Comm.sets,Dues,etc.,fair to fine. to $4.80,1969 to $5(2),many later with sets etc.,good to fine. earlies Ovpts.,1917 to 25p.,1920 to 50p.,later Comms.& Defins. 507 War Tax:M.coll.on written up pages,complete for all issues btwn. riate Phil.material inc.1989 Expo.MS.& both UPU.MS.& stamps,SG. 515 1983 Year Books for Commemoratives & Defins. + Postal Stationery. 516 1984 Year Books for Commemoratives & Defins. + Postal Stationery. 536 1992 World Columbus Stamp Expo MS.set of six,UM.,fine. (6) SG.MS.